Having sold well over 1 million dog coats The Animate Company certainly know a thing or two when it comes to designing a good dog coat! In the main, all of our winter coats are Waterproof, Windproof and Breathable and available in sizes 8" - 34". All of our coats are taped seamed and washable. Apart from the Underbelly & Greyhound coats, most over 20" have two belly straps (highlighted in the individual photographs)! 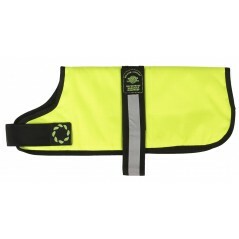 How to measure a dog coat? 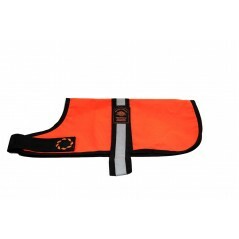 Measure from the collar along the back of the dog to the root of the tail. This will give you the measurement you need to purchase your coat. 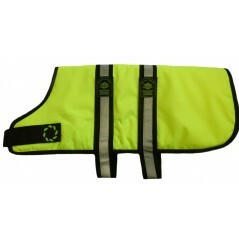 Please bear in mind however, that all dogs are built differently and whilst our generous adjustable velcro straps will cater for most dogs, there are others that will need a more bespoke fitting. If in doubt, we would always advise that you visit your local pet store for a fitting and expert advice. 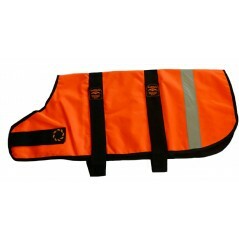 An Orange, Hi-Vis, Unlined Dog Coat by Outhwaite. This coat is Waterproof, Windproof and Washable. 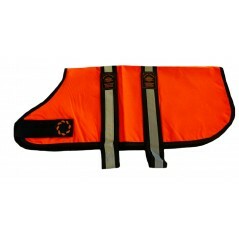 I..
High Visibility Waterproof Padded Coats! A glowing addition to the Outhwaites Range of quality coats..